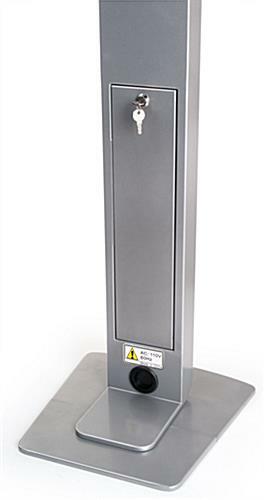 Quality structure is heavy and stays level on any flat surface! Tall construction presents photo albums and media higher up! Supports tablets in portrait or landscape orientation! 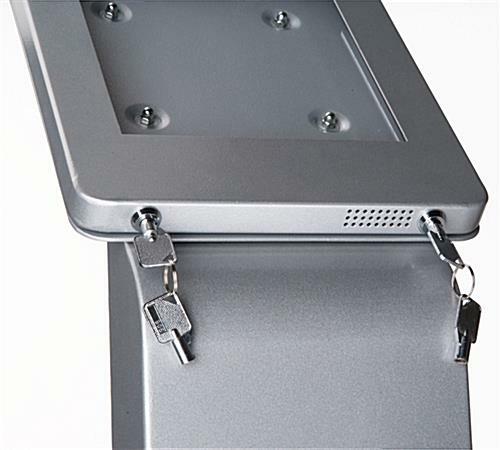 Locking mechanism includes keys to keep all devices secure within casing! Concealed power strip enables users to constantly provide power to tablet! ENTER CODE LVWL8 IN CART TO TAKE $35.00 OFF THIS ITEM! 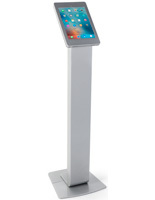 iPad enclosures, like these digital kiosk stands, can be positioned anywhere indoors in order to engage, interact and inform prospective customers! 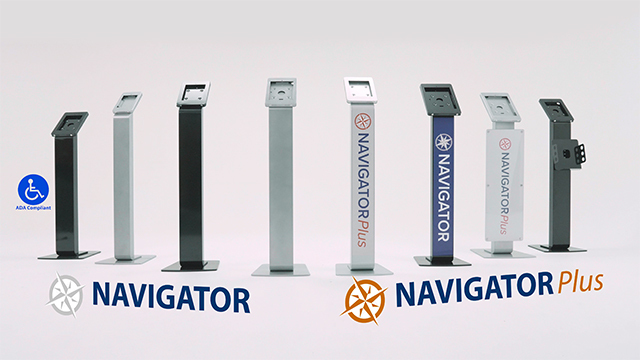 Many types of businesses use these pedestals in retail stores, tradeshows, museums, photo galleries and other unique settings to communicate messages to visitors consistently! 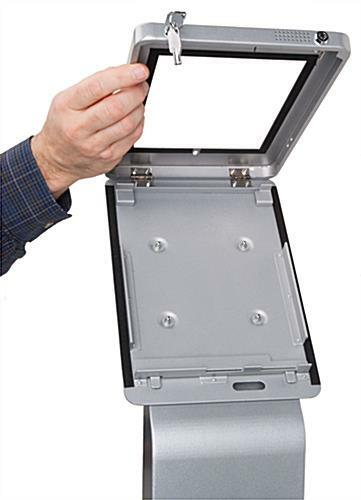 These secure electronics holders, iPad enclosure stands with dual locks provide added security to expensive technology held within the framing. Two identical keys are included which fastens the tablet inside and another set grants users access to the inner channel where chargers can be situated. 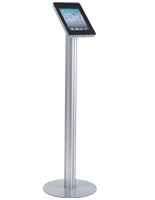 Even though most models found today cannot secure and charge devices simultaneously, these iPad enclosure stands that have a power strip integrated are one of a kind! Those who have purchased these racks value this feature tremendously and appreciate the fact that media is continuously powered. 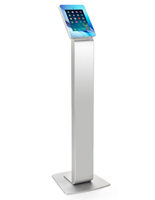 These multimedia floor stands, iPad enclosures that are used for advertising can also accommodate Apple devices in vertical or horizontal layout! Depending on the nature of use and the amount of viewable space required width wise, this convenient attribute is beneficial to all! 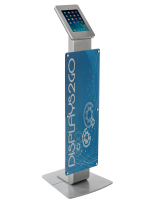 These interactive kiosk podiums, iPad enclosures that are for mobile presentations are easy to disassemble and can be relocated in an instant! Each stand is ready to be used in a matter of no time, as assembly can be done in 4 easy steps, totaling less than 5 minutes! Traveling exhibitors treasure all that these holsters have to offer! 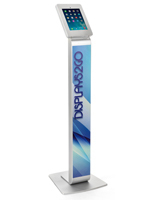 Even when events get busy and foot traffic is heightened, these iPad enclosure stands help to advertise products or services when physical interaction is impractical! 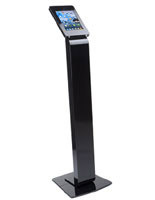 Business enterprises use these supports to not only connect with show attendees, but also to record important information obtained from booth visitors! 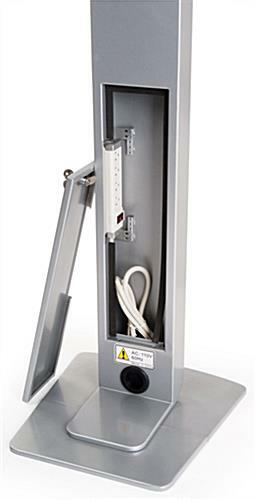 These mobile carts are an ideal, reasonable purchase for any company! 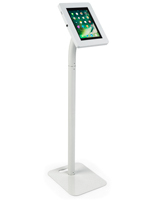 Please Note: This unit accommodates Apple® several iPad models! An Additional iPad Air Kit is included in the hardware! Although this unit holds iPads in portrait or landscape layout, the power cord along with the cable channel will be exposed while situated horizontally. Also, the home button access is covered. Cord management will not be accessible when in landscape orientation. 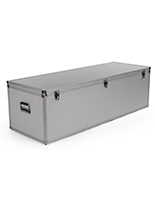 15.3" x 54.0" x 15.6"
15.3" x 0.5" x 15.6"